The Tanzimât (Turkish: [tanziˈmaːt]; Ottoman Turkish: تنظيمات‎, translit. Tanẓīmāt, lit. 'reorganization', see Nizam) was a period of reform in the Ottoman Empire that began in 1839 and ended with the First Constitutional Era in 1876. The Tanzimat era began with the purpose, not of radical transformation, but of modernization, desiring to consolidate the social and political foundations of the Ottoman Empire. It was characterised by various attempts to modernise the Ottoman Empire and to secure its territorial integrity against internal nationalist movements and external aggressive powers. The reforms encouraged Ottomanism among the diverse ethnic groups of the Empire and attempted to stem the tide of nationalist movements within the Ottoman Empire. The reforms sought to emancipate the empire's non-Muslim subjects and more thoroughly integrate non-Turks into Ottoman society by enhancing their civil liberties and granting them equality throughout the empire. In the midst of being forced to recognize the supremacy of Western power, the Ottoman elite intellectuals attempted to bring reconciliation between the West and the East within the framework of Islam. Many changes were made to improve civil liberties, but many Muslims saw them as foreign influence on the world of Islam. That perception complicated reformist efforts made by the state. During the Tanzimat period, the government's series of constitutional reforms led to a fairly modern conscripted army, banking system reforms, the decriminalization of homosexuality, the replacement of religious law with secular law and guilds with modern factories. The Ottoman Ministry of Post was established in Constantinople on 23 October 1840. The reforms emerged from the minds of reformist sultans like Mahmud II, his son Abdulmejid I and prominent, often European-educated bureaucrats, who recognised that the old religious and military institutions no longer met the needs of the empire. Most of the symbolic changes, such as uniforms, were aimed at changing the mindset of imperial administrators. Many of the officials affiliated with the government were encouraged to wear a more western style of dress. Many of the reforms were attempts to adopt successful European practices. The reforms were heavily influenced by the Napoleonic Code and French law under the Second French Empire as a direct result of the increasing number of Ottoman students being educated in France. Changes included the elimination of the devshirme system of conscription in favour of universal conscription; educational, institutional and legal reforms; and systematic attempts at eliminating political corruption. Also, a policy called Ottomanism was meant to unite all the different peoples living in Ottoman territories, "Muslim and non-Muslim, Turkish and Greek, Armenian and Jewish, Kurd and Arab". The policy officially began with the Edict of Gülhane of 1839, declaring equality before the law for both Muslim and non-Muslim Ottomans. Diplomat Mehmed Cemil Bey wearing a frock coat and a bow tie. 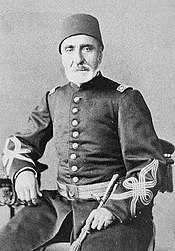 Necip Ahmed Pasha, career officer and composer in French-inspired uniform. The ambitious project was launched to combat the slow decline of the empire that had seen its borders shrink and its strength weaken in comparison to the European powers. There were both internal and external reasons for the reforms. Internally, the Ottoman Empire hoped that getting rid of the millet system would lead to direct control of all of its citizens by the creation of a more-centralized government and an increase of the legitimacy of Ottoman rule. Another major hope was that by being more open to various demographics, more people would be attracted into the empire. There was fear of internal strife between Muslims and non-Muslims, and allowing more religious freedom to all was supposed to diminish this threat. Giving more rights to the Christians was considered likely to reduce the danger of outside intervention on their behalf. The Ottomans became worried of an escalating intervention of the European powers in Ottoman affairs, another reason for the reforms. After the Crimean War, caused by Russia's incursion into the Ottoman Empire in the 1850s, Ottoman leaders tried to avoid a repeat. They thought that the Great Powers would accept the Tanzimat as long as the reforms were ongoing. Although the motives for the implementation of Tanzimât were bureaucratic, it was impulsed by liberal ministers and intellectuals like Dimitrios Zambakos Pasha, Kabuli Mehmed Pasha, the secret society of the Young Ottomans, and liberal minded like Midhat Pasha who is also often considered as one of the founders of the Ottoman Parliament. Thanks to the emerging internal, financial and diplomatic crises of 1875–1876, Midhat Pasha introduced the constitution of 1876, ending the Tanzimat. Known for his liberal ideals, Midhat Pasha is often considered to be one of the founders of the Ottoman Parliament. Cenap Sabahaddin was known for his liberal ideals and poetry influenced by French Symbolism. Kabuli Mehmed Pasha, one of the first liberal ministers during the early stages of the Tanzimat period. Prominent statesman Mizanci Murat Bey was renowned for his work on reviving the concept of Ottomanism during the Second Constitutional Era. Prince Sabahaddin proclaimed the first liberal party of the Ottoman Empire during the Second Constitutional Era. The Tanzimât reforms began under Sultan Mahmud II. On November 3, 1839, Sultan Abdulmejid I issued a hatt-i sharif or imperial edict called the Edict of Gülhane or Tanzimât (تنظيمات) Fermânı. This was followed by several statutes enacting its policies. the Press and Journalism Regulation Code (Matbuat Nizamnamesi, 1864); among others. the Nationality Law of 1869 creating a common Ottoman citizenship irrespective of religious or ethnic divisions (1869). The Hatt-ı Şerif, lit. Noble Decree or Imperial Rescript of Gülhane, was the first major reform in the Tanzimat reforms under the government of sultan Abdulmecid and a crucial event in the movement towards secularization. The decree, named after the rosehouse (gülhane) on the grounds of the Topkapi Palace, abolished tax farming. It also created a bureaucratic system of taxation with salaried tax collectors. This reflects the centralizing effects of the Tanzimat reforms. Additionally, the Edict of Gülhane imposed forced military conscription within the administrative districts based on their population size. However, the most significant clause of the Gülhane decree is the one enforcing the rule of law for all subjects, including non-Muslims, by guaranteeing the right to life and property for all. This put an end to the kul system, which allowed the ruler's servants to be executed or have their property confiscated at his desire. These reforms sought to establish legal and social equality for all Ottoman citizens. The reforms eliminated the millet system in the Ottoman Empire. The millet system created religiously based communities that operated autonomously, so people were organized into societies, some of them often receiving privileges. This clause terminated the privileges of these communities and constructed a society where all followed the same law. The new reforms called for an almost complete reconstruction of public life in the Ottoman Empire. Under the reconstruction, a system of state schools was established to produce government clerics. Ottomans were encouraged to enroll. Each province was organized so that each governor would have an advisory council and specified duties in order to better serve the territory. The new reforms also called for a modern financial system with a central bank, treasury bonds and a decimal currency. Finally, the reforms implemented the expansion of roads, canals and rail lines for better communication and transportation. The reaction to the edict was not entirely positive. Christians in the Balkans refused to support the reforms because they wanted an autonomy that became more difficult to achieve under centralized power. In fact, its adoption spurred some provinces to seek independence by rebelling. It took strong British backing in maintaining Ottoman territory to ensure that the reforms were instated. Mehmed Emin Âli Pasha, the principal architect of the Islâhat Fermânı. The Reform Edict of 1856 was intended to carry out the promises of the Tanzimat. The Edict is very specific about the status of non-Muslims, making it possible "to see it as the outcome of a period of religious restlessness that followed the Edict of 1839". Officially, part of the Tanzimat's goal was to make the state intolerant to forced conversion to Islam, also making the execution of apostates from Islam illegal. Despite the official position of the state in the midst of the Tanzimat reforms, this tolerance of non-Muslims seems to have been seriously curtailed, at least until the Reform Edict of 1856. The Ottoman Empire had tried many different ways to reach out to non-Muslims. First they tried to reach out to them by giving all non-Muslims an option to apply for Dhimmi status. Having Dhimmi status gave non-Muslims the ability to live in the Ottoman Empire and own property but this ability was not without special taxes (jizya). For the "Ottoman ruling elite, 'freedom of religion' meant 'freedom to defend their religion'". The 1876 Constitution: Sultan Abdul Hamid II, the Grand Vizier, and the millets grant freedom to an idealized female figure representing Turkey, whose chains are being smashed. The flying angel displays a banner with the motto of the French Revolution: Liberty, Equality, Fraternity in Turkish (Arabic script) and in Greek. The scene takes place in a generic Bosphorus scenery. Reproduced from a 1908 postcard (the printed caption of 1895 is inaccurate) celebrating the re-introduction of the constitution thanks to the Young Turk Revolution of 1908. Although the Edict of Gülhane and the Tanzimat provided strong guidelines for society, it was not a constitution and did not replace the authority of the sultan. Still, the Tanzimat reforms had far-reaching effects overall. Those educated in the schools established during the Tanzimat period included major personalities of the nation states that would develop from the Ottoman Empire, such as Mustafa Kemal Atatürk and other progressive leaders and thinkers of the Republic of Turkey and many other personalities from the Balkans, the Middle East and North Africa. The system was ultimately undone by negotiations with the Great Powers following the Crimean War. As part of the Charter of 1856, European powers demanded a much stronger sovereignty for ethnic communities within the empire, differing from the Ottomans, who envisioned equality meaning identical treatment under the law for all citizens. That served to strengthen the Christian middle class, increasing their economic and political power. Arab notables generally opposed the Tanzimat. They could see that positions of administrative authority in the changing Ottoman state were going to young men trained in the government schools. Beginning in the 1870s, many of the leading Arab families adopted the practice of enrolling their sons in the higher academies of Constantinople. Upon completing their studies, these young Arabs obtained positions in the Ottoman bureaucracy and thus gave their families access to the government. Indeed, throughout the Tanzimat, the Arab urban elite managed to preserve their privileges and to make themselves indispensable to the Ottoman officials sent out from Constantinople. The politics of the notables survived the centralizing reforms. The reforms peaked in 1876 with the implementation of an Ottoman constitution checking the autocratic powers of the Sultan. The details of this period are covered under the First Constitutional Era. Although the new Sultan Abdul Hamid II signed the first constitution, he quickly turned against it. State institutions were reorganized; laws were updated according to the needs of the changing world; modern education, clothing, architecture, arts, and lifestyle were encouraged. This reorganization and addition of state institutions resulted in an enormous increase in the number of bureaucrats in the Ottoman Empire. Some scholars argue that from the Muslim population's traditional Islamic view, the Tanzimat's fundamental change regarding the non-Muslims, from a status of a subjugated population (dhimmi) to that of equal subjects, was in part responsible for the Hamidian massacres and subsequent Armenian Genocide. In their view, these were inevitable backlashes from the Muslim community to the legal changes, as the Tanzimat's values were imposed from above and did not reflect those of society. In Lebanon, the Tanzimat reforms were intended to return to the tradition of equality for all subjects before the law. However, the Sublime Porte assumed that the underlying hierarchical social order would remain unchanged. Instead, the upheavals of reform would allow for different understandings of the goals of the Tanzimat. The elites in Mount Lebanon, in fact, interpreted the Tanzimat far differently from one another, leading to ethno-religious uprisings among newly emancipated Maronites. As a result, "European and Ottoman officials engaged in a contest to win the loyalty of the local inhabitants — the French by claiming to protect the Maronites; the British, the Druze; and the Ottomans by proclaiming the sultan's benevolence toward all his religiously equal subjects." In Palestine, land reforms, especially the change in land ownership structure via the Ottoman Land Law of 1858, allowed Russian Jews to buy land, thus enabling them to immigrate there under the first Aliya. In order to boost its tax base, the Ottoman state required Arabs in Palestine, as elsewhere, to register their lands for the first time. As a rule the fellahin didn't trust the ailing regime, fearing that registration would only lead to higher taxation and conscription. Prevailing illiteracy among the fellahin meant in the end that many local mukhtars were able to collectively register village lands under their own name. Thus, they were able to later claim ownership and to sell the local peasants' lands out from under their feet to the new Jewish immigrants, as they themselves relocated permanently to Syria or Turkey. Alternately, rich Christian or Muslim families, the class of the 'Effendis', were able to accumulate large amounts of land which they exploited by themselves or sold on. In Armenia, the Armenian National Constitution (Ottoman Turkish: "Nizâmnâme−i Millet−i Ermeniyân") of 1863 was approved by the Ottoman government. The "Code of Regulations" consisted of 150 articles drafted by the Armenian intelligentsia and defined the powers of the Armenian Patriarch under the Ottoman millet system and the newly formed "Armenian National Assembly". Members of the Committee of Union and Progress proclaiming the Second Constitutional Era. An old photograph of the Parliament during the Second Constitutional Era. 1908, Meeting of the Parliament. Building of the Ottoman Parliament. The Imperial Ottoman Bank Headquarters, 1896. Personnel of a branch in Konya, 1889. Tobacco factory in Samsun, 1910. ^ a b Guler, Emre. Masculinities In Early Turkish Republican Novels (1924-1951). MA History Thesis. Istanbul Bilgi University, 2014. Web. 5 Mar 2018. ^ "History of the Turkish Postal Service". Ptt.gov.tr. Retrieved 6 November 2011. ^ a b Strohm, Frederic (2016). Istanbul im 19. Jahrhundert. Die Modernisierungsbestrebungen in der osmanischen Hauptstadt – lokale Faktoren und globale Einflüsse. http://othes.univie.ac.at/44628/1/46526.pdf. pp. 34–. ^ Lindgren, Allana; Ross, Stephen (2015). The Modernist World. Routledge. ISBN 978-1317696162. Retrieved 6 May 2017. ^ Yapp, Malcolm (9 January 2014). The Making of the Modern Near East 1792-1923. Routledge. p. 119. ISBN 978-1317871071. Retrieved 6 May 2017. ^ Hanioğlu, M. Şükrü (1995). The Young Turks in Opposition. Oxford University Press. ISBN 978-0195358025. Retrieved 6 May 2017. ^ The Syrian Land: Processes of Integration and Fragmentation : Bilād Al-Shām from the 18th to the 20th Century. Franz Steiner Verlag. 1998. p. 260. ISBN 978-3515073097. Retrieved 6 May 2017. ^ Zvi Yehuda Hershlag (1980). Introduction to the Modern Economic History of the Middle East. Brill Archive. pp. 36–37. ISBN 978-90-04-06061-6. Retrieved 9 June 2013. ^ Caroline Finkel (19 July 2012). Osman's Dream: The Story of the Ottoman Empire 1300-1923. John Murray. pp. 6–7. ISBN 978-1-84854-785-8. Retrieved 11 June 2013. ^ Selçuk Akşin Somel (2010). The A to Z of the Ottoman Empire. Rowman & Littlefield. p. 188. ISBN 978-0-8108-7579-1. Retrieved 9 June 2013. ^ Cleveland, William (2013). A History of the Modern Middle East. Boulder, Colorado: Westview Press. pp. 85–86. ISBN 978-0813340487. Gelvin, James L. (2008). The Modern Middle East: A History (Second ed.). Oxford University Press. ISBN 978-0-19-532759-5. Cleveland, William L., and Martin P. Bunton (2012). A History of the Modern Middle East (Fifth ed.). Routledge. Print. ISBN 978-0813348339.